Trail 127 mm / 5 in. Rear Wheel Travel 250 mm / 9.8 in. Dimensions Length: 2350 mm / 92.5 in. Height: 1266 mm / 49.8 in. Seat Height 920 mm / 36.2 in. 196.5 kg / 433 lbs. Twenty-five years after it created the 'big enduro' off-road genre, BMW Motorrad have launched the HP2 enduro ('High Performance 2-cylinder') - an uncompromising, sporting and exceptionally light road-legal off-road motorcycle. The HP2 is the first model in a new, independent category of motorcycles being developed by BMW Motorrad. Called the HP High Performance series, this new range of motorcycles will be extremely special, exclusive and authentic - and they will remain relatively rare. The price of the machines will be determined by their outstanding range of features; a much higher level of product substance; and comparatively small production volume. The HP2 is the most powerful and dynamic off-road boxer twin yet - and is the most powerful enduro bike in the marketplace to-date. When ridden on rough terrain the HP2 capitalises on the benefits of the boxer concept and its low centre of gravity. But with agile handling, low weight and a high-performance power unit, it also offers supreme on-road riding capability. Consistent lightweight engineering of all components on the HP2 has resulted in an overall dry weight of just 175 kilos. Along with ideal rider ergonomics, this guarantees superior agility and easy control on even the toughest terrain. When combined with the low centre of gravity of the Boxer engine, excellent balance, unparalleled smoothness and powerful acceleration from low engine speeds, the HP2 is superior to even the toughest single-cylinder machines on demanding tracks. To highlight the sporting enduro qualities of the new HP2, BMW Motorrad is supporting a private racing team, which and has entered HP2s in off-road events such as the German Cross Country Championship (GCC). Outside Germany, the HP2 has been entered in the Baja 500 and the Baja 1000 races, and the Erzberg Race in Austria. BMW Motorrad will supply the machines, and support and service private teams at these events. Other races are also being considered. As an added-value incentive, all riders who purchase the new HP2 from any BMW Motorrad UK dealership will automatically receive a unique off-road HP2 experience which includes a day's off-road training at BMW's Off-Road School in Wales directed by 6-times Dakar rally competitor Simon Pavey, as well as dinner and overnight accommodation. instrument cluster as per the R1200 GS but with no rev counter. As an additional display, the rider can select the number of operating hours the motorcycle has run (important for changing the air filter at appropriate intervals when riding off-road on dusty tracks). a wide range of special equipment for retrofitting is available for customisation, allowing the owner to broaden the HP2's range of features and equipment. The dream of many BMW boxer fans is about to come true: BMW Motorrad proudly presents the HP2 - a truly uncompromising, sporting and exceptionally light enduro machine. The high quality, dynamic, boxer-engine bike has been built for the serious off-road rider for use on the most demanding tracks in the world. Classicist, stylish and equipped with the finest, care-fully considered features, the BMW HP2 has everything necessary for unrestricted riding enjoyment when off the beaten track. It is also perfect as a 'basic' machine for grassroots enduro motorsport. More than any other motorcycle, the HP2 capitalises - on rough terrain - on the benefits of the boxer configuration with its low centre of gravity. However, the agile handling, low weight, and high-performance power unit of the HP2 also offers supreme riding pleasure on all tarmac roads. Considering the many options it offers, the HP2 is the most powerful and by far the best off-road boxer of all time. A small and highly dedicated team consisting of specialists, engineers and mechanics that are fully committed to the boxer concept developed the HP2. Privately dedicated to off-road motorsport these enthusiasts, working beyond the usual constraints of series development, employed a simple and straightforward edict that "only an enthusiastic professional can offer other enthusiastic professionals what they really want". 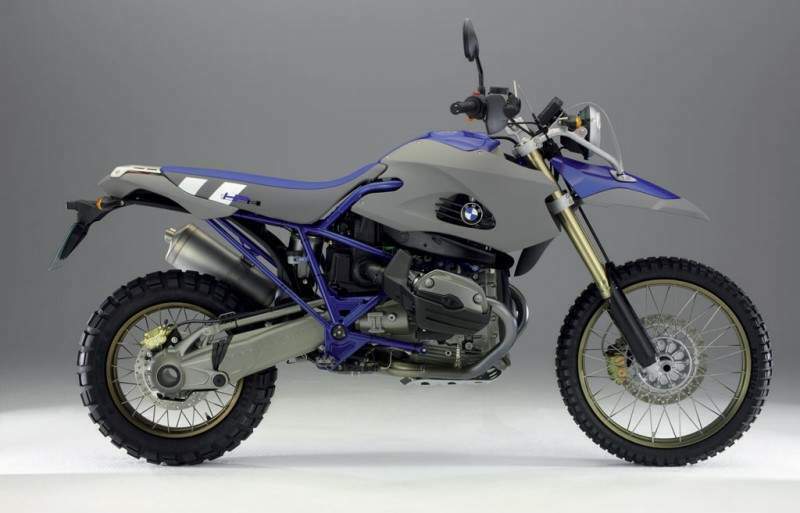 In technical terms, the BMW HP2 is based on the R1200 GS. It is however, tailored in every respect to the needs and preferences of the ambitious enduro rider. The all-new lightweight suspension is based on ample experience gained by BMW in marathon rallies. The air/spring/damper system on the rear wheel is an industry world-first achievement. The engine itself has been optimised for minimum weight and the entire drive train configured specifically for off-road use. Consistent lightweight engineering has been applied to all components on the new HP2. As a result, the overall weight of the motorcycle (in road trim) remains below the 200-kilo barrier (according to the DIN standard of 195kg (430 lb). Dry weight is a mere 175 kilos (386 lb). In conjunction with the new machine's matchless ergonomics, the lightness guarantees supreme agility and easy control even on the toughest terrain. The combination of the low centre of gravity of the boxer engine, excellent balance, unparalleled smoothness and powerful acceleration from low engine speeds, the HP2 is mostly superior to even the toughest single-cylinder machines when negotiating difficult and slow trial tracks. The enduro boxer also delivers superior performance and riding stability on (and off) fast sections of off-road terrain. A new brand name and a new model designation: 'HP' is short for High Performance and the '2' in the model designation signifies the flat-twin power unit. The term 'High Performance' obviously relates to the machine's sporting potential and outstanding qualities and not just the extra power from the engine. So High Performance means a perfect balance of all individual components when viewed as a complete unit. This is the symbiosis of a perfectly developed overall concept, attention to detail, superior riding characteristics and pure riding pleasure. Finally, 'HP' also stands for the prestige associated with such a sophisticated and refined motorcycle. The HP2 is the first model in a new, independent category of motorcycles being developed by BMW Motorrad. The HP series will use the technical foundation of the commercial series models but stand apart in their uncompromising dedication to a specific purpose - a clear and consistent orientation towards sporting performance and the most exclusive product features. The HP range of very special motorcycles is being developed by small teams of truly passionate professionals that work beyond the usual structures required by a larger production series. Such special teams have concepts that guarantee many years of experience, a feeling for the essential, personal know-how, and an individual touch will go straight into the product, without constraint or devaluation. The engineers will use the most advanced development and simulation technology, plus all the technical options offered by BMW. It is this combination of high technology and craftsmanship that will give BMW Motorrad's HP motorcycles their unique charm and appeal. In a nutshell, BMW high-performance motorcycles are something special - they are exclusive and authentic and will be relatively rare in the market. The prices of the special machines will result from an outstanding range of features, a much higher level of product substance and comparatively small production volume. Exclusive training and fascinating off-road adventures are being prepared specifically for HP2 owners, i.e. enthusiasts with particular riding skills and demands. In the future, additional offers will also supplement the new high-performance concept. In technical terms, the HP2 is developed from the R1200 GS. However, with the exception of the engine and the on-board network, nearly all components are either new developments or have been widely modified. Saving weight and an uncompromising focus on the requirements of off-road riding were the overriding criteria for the development engineers. Testing the HP2 was obviously a tempting but demanding and elaborate experience because of the new machine's extremely wide range of features and riding options: From the toughest off-road conditions all the way to full throttle on the autobahn, and from freezing cold to the most extreme temperatures encountered in a desert, the new motor-cycle had to reliably and permanently cope with the most difficult riding situations hardly any other machine will face. The range of tests and trials the HP2 was subject to was comprehensive and thorough. These included a wide range of dynamometer testing, extreme off-road testing on BMW test tracks and proving sessions in the hottest and coldest countries. Entering the Baja California Desert Race - under the guidance of Jimmy Lewis - was as much a part of the testing of the entire motorcycle and its individual components as the high-speed trials on the autobahn and other types of test route. Off-road endurance trials in Spain and South Africa finally completed a full range of activities before the HP2 was cleared for series production. By making a few adjustments to the engine control unit, BMW Motorrad's development engineers slightly increased the output of the flat-twin engine (versus the R1200 GS) so that maximum output on premium plus fuel (RON 98) is now 77kW (105 hp). Maximum torque remains unchanged at 115 Nm (85 lb-ft) at 5,500rpm. The high standard of smoothness and refinement of the boxer configuration and design, as well as the soft but powerful development of torque from very low engine speeds, enable the rider of the HP2 to manoeuvre the machine slowly and smoothly without recourse to the clutch. This superiority comes from the refined, torque-based engine management of the new boxer generation with its automatic idle speed control. As a result, the HP2 is able to realise its advantages on very rough tracks, or in deep mud, situations where spontaneous power and torque are paramount. As the HP2 will be used mainly in rough terrain - and in the interest of less weight - the engine does not feature a balance shaft. The intake air snorkel has been slightly modified and now features a deflector at the front to keep out water with maximum efficiency. This deflector may be removed on machines that will be used primarily on the road. 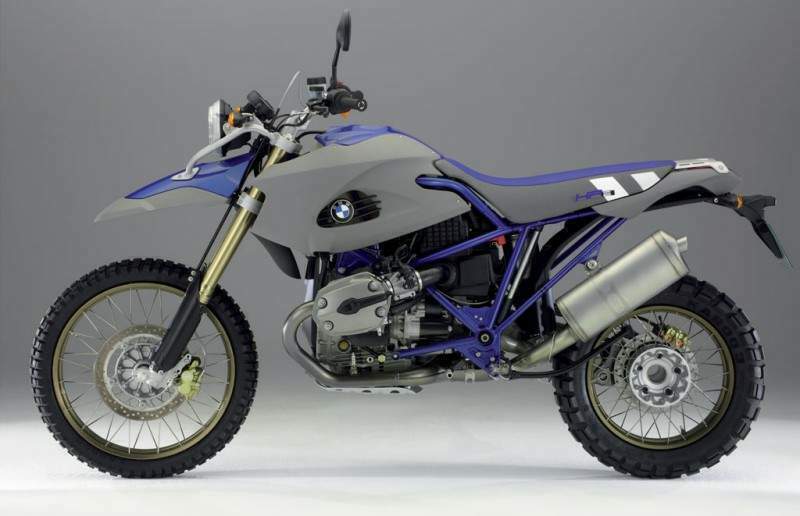 The exhaust manifold has been carried over from the R1200 GS without changes, while the rear-end silencer is a new construction almost two kilos lighter than before. As the interior of the silencer is similar to the former unit, the reduction in weight results from the sleeve pipe being omitted and a shorter length of silencer. The reduction in length has been made possible because is not intended for the HP2 to carry cases or hard luggage. On the six-speed transmission, BMW Motorrad's engineers have modified and reinforced the bearings on the interim shaft to cope with higher loads and forces. The gear ratios and other features are the same as on the R1200 GS. An entirely new feature is the special Paralever swinging arm (see section on the HP2's running gear) and the drive-shaft now features a modified rubber damper adjusted in length to the different dimensions of the Paralever. At 2.82:1, the secondary trans-mission ratio on the drive-shaft remains unchanged. The entire drive train comes with a high-quality, magnesium-coloured powder coating. The running gear and suspension of the HP2 is a new development using carefully selected, high-grade components. 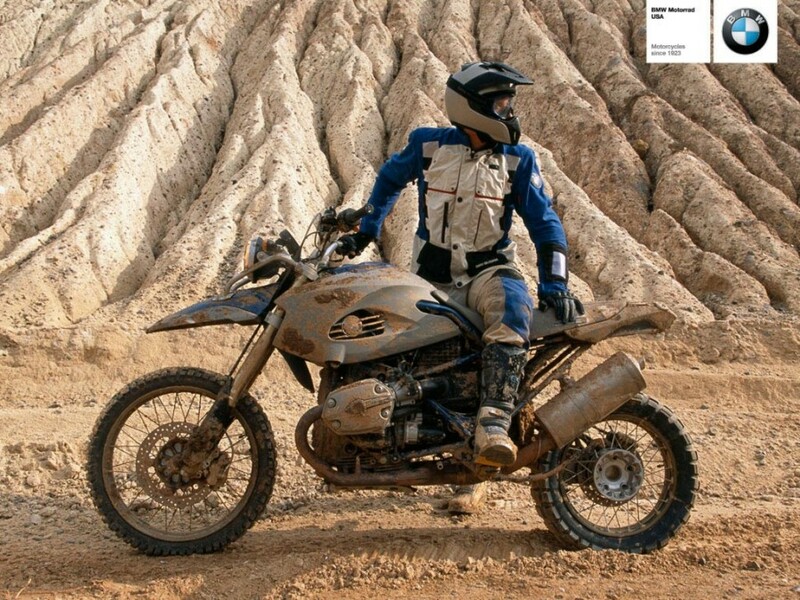 Indeed, BMW Motorrad's 25 years of experience in enduro riding has gone into the development of the running gear. Focusing on the geometry and overall configuration of the suspension, the engineers' objective was to bridge the gap between optimum riding qualities with a high standard of directional stability (say, on the motorway) and excellent off-road riding qualities, ease of handling and superior agility. The frame layout is based on knowledge acquired by BMW Motorrad with the R900 R race machines used by works teams from 1999-2001 in the Dakar Rally and other international desert races. The frame is a tubular spaceframe structure made of steel to ensure optimum homogeneous stiffness. Front-wheel suspension on the HP2 is by telescopic fork with 270mm (10.63in) of spring travel in upside-down construction. A conventional Telelever set-up could not sensibly provide that level of spring travel. A special feature of the front-wheel fork is travel-dependent damping with inbound and rebound stages adjusted separately in a wide range of settings. A further adjustable feature is the hydraulic system that prevents the running gear from sagging in extreme conditions. The most outstanding feature, absolutely unique to BMW Motorrad, is that damping in the inbound stage under pressure remains relatively independent of the degree of harshness in avoiding any sagging effect on the motorcycle. In other words, ride harshness and damping can be set to "hard" without making the inbound damping response in the main operating range significantly firmer. With its fixed sleeve tube measuring 45mm (1.77 in) diameter, the fork provides the stiffness required and at the same time allows the maximum steering lock. The fixed-sleeve tubes come with an extremely resistant special coating that will withstand wear even better and more efficiently than a conventional surface coating based on titanium nitride. For rear-wheel suspension, the engineers at BMW Motorrad focused on the principle of the BMW Paralever swinging arm being totally re-developed as a lightweight component for the new generation of boxers. Hardly open to further improvement in terms of its effective-ness, the Paralever has nevertheless been redesigned for the HP2 - now 30mm (1.18in) longer than on the GS. The new Paralever is a welded structure made up of high-strength, forged light-alloy shells able to cope with even the toughest requirements in sports enduro riding. From the outside, the sophisticated new construction is characterised by the magnesium-coloured powder coating on the entire drive-train. BMW Motorrad is once again setting a new standard for the spring strut by introducing a highly innovative world-first in motorcycle suspension technology: Together with German specialist Continental Automotive Systems, BMW's engineers have developed a spring/damper system running exclusively on air. Weighing just 2.3 kilos (5.1lb) the air/spring damper system is approximately two kilos lighter than a conventional structure, although the basic configuration and the system of damper operation show significant analogies. The air spring strut also features a piston moving into the damper chamber. However, the piston acts not on hydraulic fluid, but on air forced through plate valves into a second chamber. The damping effect is achieved by throttling the flow of air - and with air being compressible; the air captured in the chamber is able to provide the necessary spring effect to replace a conventional steel spring. Air is a medium with ideal characteristics for a spring damper system and offers a wide range of advantages. 'Natural' progression of the spring rate under high load - with pressure in the system increasing. A high standard of security against the spring damper system giving way - according to the law of gas mixtures, pressure increases as a function of temperature. 'Natural' progression of the damping effect under high loads - the viscosity of air increases as a function of temperature. Frequency-dependent selective damping with automatic adjustment of the dampers to the load the motorcycle is currently carrying. Resistance to overheating - no temperature-induced decrease in damping under high load - for example, on bumpy roads and cobble-stone surfaces. Simple adjustment to the load the motorcycle is carrying. Simple adjustment of seat height. With unsprung masses being slightly lower than before, the response of the suspension and rear-wheel traction have been improved. In structure, the air spring strut comes with three air chambers one be-hind the other and connected by air ducts. An aluminium cylinder forms the two upper chambers, which are separated by a piston. Longitudinal movement of the separating piston compresses the air in the cylinder - the air thus acts as a kind of spring. At the same time a defined volume of air flows into the other chamber via plate valves (slot throttles) and, through the throttling effect, dampens any movements of the wheel. The lower air chamber is formed by a gas-tight rolling gaiter made of rubber tissue. This gives the damper freedom to move up and down and seal the spring strut to the outside, avoiding the need for a piston rod seal, which would merely increase friction in the system. The resistance built up by the rubber gaiter when rolling over a specially shaped cone supplements the progressive effect of the system. To the outside the spring strut is fully sealed and airtight - any leakages that might occur can be compensated for by filling in air through a valve. Such variation of air pressure from outside also allows basic adjustment of seat height simply by pumping in or discharging air as required. Inbound spring travel is however reduced with the seat set to a lower position, meaning that this particular setting is more appropriate for a moderate style of riding. Adjusting the system to different load conditions is a very simple operation requiring only an appropriate change in air pressure. A minor but nevertheless important and interesting feature is the small 'inspection balance' on the rear frame. This allows the rider to read the normal setting of the motorcycle in the interest of easier adjustment. And to pump up the system while travelling, the HP2 naturally comes as stand-ard with a manual high-pressure pump, complete with pressure gauge, which is also suitable for inflating tyres. A unique feature of the air/spring damper system is the option to vary the damping effect by carefully adapting the inner flow system together with the slot throttles. An important effect achieved in this way is the significant improvement of rear-wheel traction on undulating surfaces. The damping effect is specifically configured in the frequency bands of the rear-wheel swinging arm system, which enables the wheel to efficiently track uneven surfaces and maintain optimum ground contact. This means better traction when accelerating hard and extra safety when applying the brakes. Whenever the springs sag completely (as is often the case on long and stretched-out surface 'waves' and under high loads) the 'natural' adjustment of the air spring rates, together with frequency-specific damping, again acts against any excessive compression of the springs to prevent them from giving way. The basic set-up of the dampers may also be adjusted by a hand-wheel, which opens a bypass in the damper. This allows adjustment in two stages between a more comfort-oriented roadgoing set-up and a firmer setting for rough terrain. A significant advantage of the system is the total resistance of the spring strut to dirt and contamination (from outside) thanks to the fully enclosed surface. This eliminates the slightest wear on the seals and guide units, even when they are subjected to ingress from the finest desert sand. Again reflecting its concept as a genuine off-road machine, the HP2 comes with cross-spoke wheels, which have proven their qualities in all tests. In the interest of maximum ground clearance and optimum guidance, the front wheel measures 1.85 x 21, while wheel size at the rear is 2.5 x 17. 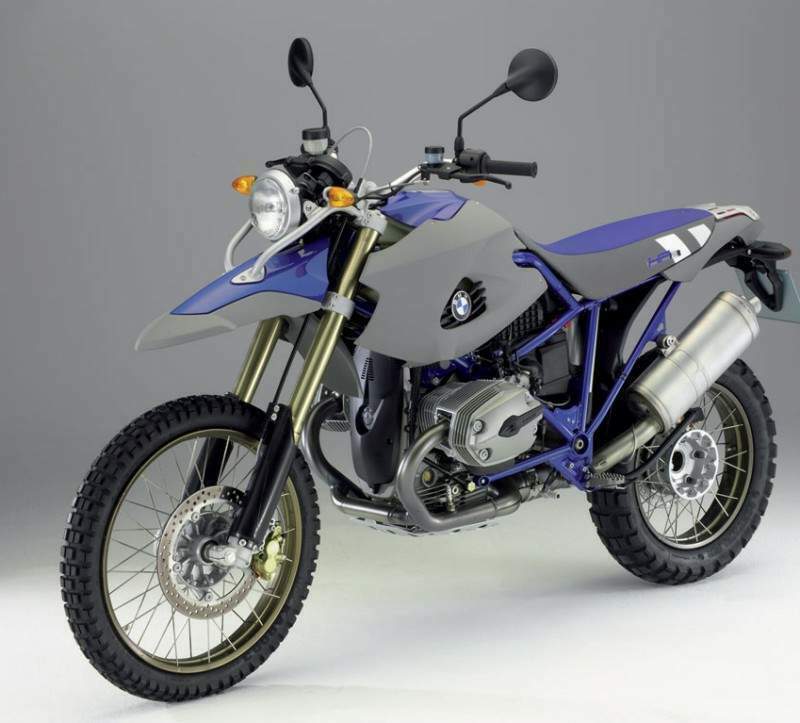 The tyres fitted as standard are tubeless Karoo tyres developed by Metzeler and BMW Motorrad especially for the HP2. The brand-new high performance off-road tyres measure 90/90-21 at the front and 140/80-17 at the rear. Motocross-like tyres with a high share of negative tread are available as special equipment primarily for off-road use. Also registered for riding on the road, the tyres are also a joint development by BMW Motorrad and Metzeler specifically for the HP2. Tubed tyres with a different tread may be used for off-road riding. In this case the rear wheel comes as standard with a second valve bore allowing the use of tyre supports (special equipment) for riding with lower air pressure. On tubeless tyres, a second tyre valve seals a second valve hole. The brake system of the new HP2 has first-class stopping power. The front wheel features a single-disc brake with floating calliper - the semi-floating brake disc measures 305mm (2.01in) diameter and is only 4.5mm (0.18in) thick. At the rear, the HP2 features a single-disc swing-calliper brake (as per the R1200 GS) with a disc diameter of 265mm (10.43in). The brake hoses are clad only in steel at the front. The rear-wheel brake on an enduro needs a somewhat softer pressure point, which is why a conventional rubber tissue brake hose is used. On entering the market, the HP2 will come without ABS brakes. When designing the fuel tank, seat and controls, BMW Motorrad's engineers and developers focused in particular on the ergonomic requirements of off-road riding with the rider frequently standing on the footrests. The fuel tank on the HP2 is brand-new and made of extra-tough, semi-transparent, highly networked polyethylene. This is an optimum, extra-light material and is protected by a light plastic cover. Tank capacity is 13 liters or 2.9 Imp gals. The cut-out in the cover allows the rider to check the level of fuel from outside, two lines on the scale ensuring precise assessment of the fuel level. Whenever the rider fills up the tank from jerry cans when riding in rough terrain, this sight inspection option from outside is more practical than any electrical gauge (particularly as the latter would always provide an uncertain reading due to the constant change in the motorcycle's position under off-road conditions). However, the HP2 does come with a fuel reserve warning light. To ensure optimum guidance and control of the motorcycle the engineers have sought to keep the frame and motorcycle contours at the transition point from the tank to the seat as slender and lean as possible. The two-colour seat is slender in shape and design, particularly at the front, and this extends all the way back into the tank. The absolute geometric seat height for the rider is 920mm (36.22in) with a step-arch length of 1,920mm (75.60in). A lower seat available as special equipment measures 900mm (35.43in) in height. Asymmetrically drilled handlebar clamps allow the rider to set the wide handlebar to two different positions. Turning the clamps through 180 degrees moves the fore and aft position of the handlebar by 20mm (almost 0.8in). The handlebar is made of aluminium and tapers in conical shape to the ends. Particular significance is given to a large steering lock of 42 degrees (left and right) to ensure superior agility and safe control of the motorcycle even at extremely low speeds. The footrests made of rust-free stainless steel are extra-wide for superior stability, regardless of riding posture or position of the feet. A particular feature is a fold-ing spacer on the footbrake lever to enable the rider to set the position of the lever (relative to the foot) without using tools. This mechanism, patented by BMW, does not change the position of the brake lever relative to the brake cylinder despite the easy and convenient process of adjustment. The innovative on-board network in CAN-bus technology (Controller Area Network) has been carried over without changes from the R1200 GS. The straightforward configuration of the system has fewer cables than a conventional on-board network; clear configuration without conventional meltdown fuses, and full diagnostic compatibility of the on-board net-work. Another advantage is the low weight of the system. An integrated electronic immobiliser comes as standard and works by exchanging coded, constantly changed data between the key to the motorcycle (the transponder) and the motorcycle's on-board electronic system. This is currently the best and safest technology for an immobiliser. The instrument cluster also concentrates on the essential - even omitting a rev counter - as the off-road rider only needs a speedometer and an information flat screen. The technical features and configuration of the instrument cluster have again been carried over from the R1200 GS. As an additional display function, the rider can call up the number of operating hours the motorcycle has been running. This is important for changing the air filter at appropriate intervals when riding mainly off-road on dusty tracks. In its design, the HP2 is purist through and through. Reduction to essentials is a significant styling feature particularly on the body of the new machine - only the tank cover and part of the mudguard have been painted. Plastic components at exposed points, such as side components on the tank and the front wheel mudguard, are made of fully coloured, grained plastic without any application of paint. This means that scratches, should they occur, remain virtually invisible and do not catch the eye in any way. The HP2 comes exclusively in Indigo Blue Metallic/Alaska Grey. The headlight mounting is a good example of the new machine's high standard of all-round functionality. Extremely strong and stable, the headlight support also serves as a conveniently positioned salvaging bar. Grab recesses at the rear (beneath the seat) are purposely sited to remain dirt-free. The number-plate support and direction indicators can be easily removed for off-road riding by means of five bolts while a connector separates the associated cables. A transparent plastic cover which can be fitted in front of the headlight in order to protect the headlight glass from stones thrown up by riding on rough terrain. The protection unit is not homologated for public roads. A so-called 'brake-snake', which is a small steel rope around the footbrake pedal to prevent stones, branches or other objects from getting stuck between the lever and the engine. It also prevents bending, blocking, or even inadvertently operating the lever and applying the brakes when not required. No optional extras from the factory will be offered upon introduction of the new HP2 motorcycle. 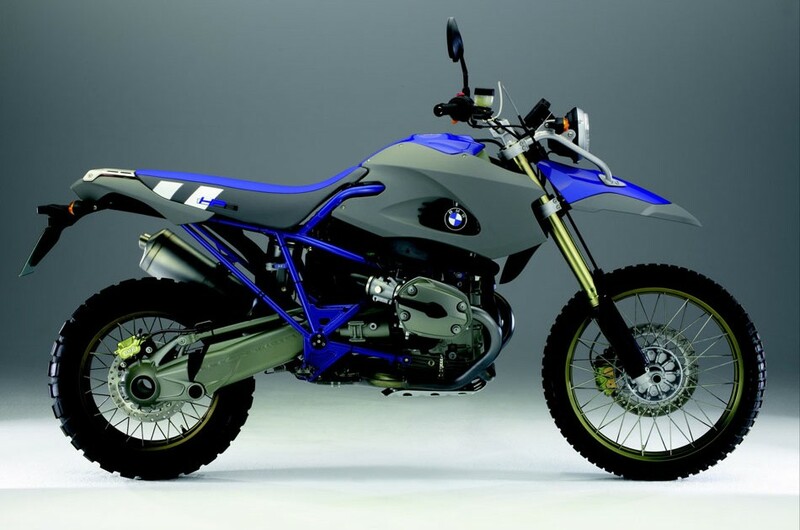 However, a wide range of special equipment for retrofitting, either by the customer or BMW motorcycle dealership, is available for customisation to allow owners to subsequently broaden the motorcycle's range of features and equipment. Clutch - Single-plate dry clutch, dia 180 mm/7.1? ?